treadFEST 2017 presents five stages with a mix of music genres: Grimehouse, New Hero and Opposite the Other are just three among a host of bands and DJs in the pipeline. Welcome to the filthy side of South African Drumstep: Grimehouse. His tracks are played by some of the biggest artists in the world, including the Beatport Studios Live and a compilation for one of the world’s biggest record labels “MAD DECENT”. But this is just the beginning for the filth monster! Grimehouse’s tracks are racking up thousands and thousands of plays every month on his Soundcloud page and he tries to give out at least one free track each month just to say thanks for the support. You can find him at treadFEST, laying down the dirty in a way only he knows how! New Hero is the formation of Keaton Carelse (aka Grimehouse) and Scottie Moore (lead singer of Reburn). New Hero is non-genre specific armed only with the common goal of creating music that takes you on a journey to make you feel good. The duo has a history that stems back to their late teens when they met as DJ’s in the Cape Town underground music scene. They went their separate ways and both explored completely different styles. Keaton making a name as Grimehouse, while Scottie went on to front chart topping SAMA-nominated indie rock band Reburn. Catch New Hero at treadFEST, with their chart-topping hits, such as “Chasing Hurricanes”, “Kryptonite” and “Closer”. Opposite the Other. Let them speak for themselves: “There’s a fear: a fear of not doing what you’re meant to do. A fear of not being who you’re meant to be. We hesitate in being who we’re meant to be because who we’re meant to be is often who others say we’re not supposed to be. 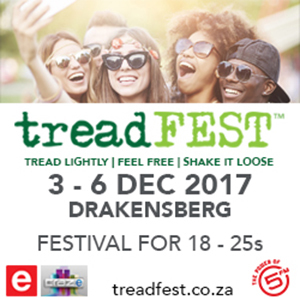 In addition to great music, treadFEST activities range from hiking and cycling to sunrise yoga, from outdoor movies to Battle of the Bands to War of the Words. Booking is through the website: www.treadfest.co.za.